Digestive biscuit crumb topped with cheesecake filling and lemon compote. Creamy & Zesty. Digestive biscuit crumb layered with a fruity lemon compote. 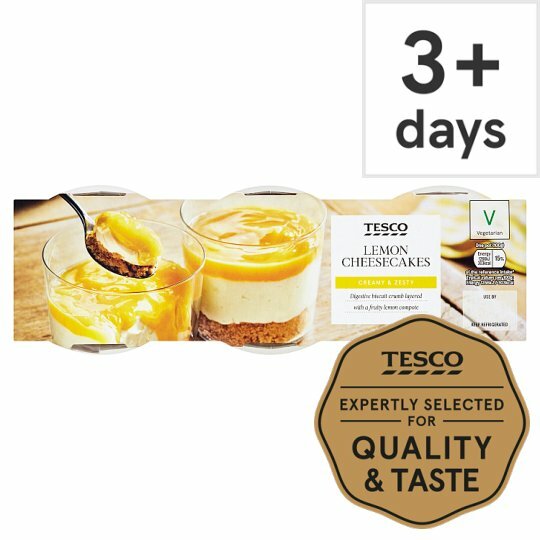 Our cheesecakes are made by a family run business in Devon. The recipe uses digestive biscuits for a crumbly base, and full fat soft cheese for creaminess. INGREDIENTS: Full Fat Soft Cheese (Milk) (21%), Sugar, Water, Wheat Flour (Wheat Flour, Calcium Carbonate, Iron, Niacin, Thiamin), Whipping Cream (Milk), Lemon Juice from Concentrate (9%), Egg, Palm Oil, Rapeseed Oil, Maize Starch, Potato Starch, Dried Skimmed Milk, Demerara Sugar, Whey Powder (Milk), Invert Sugar Syrup, Emulsifier (Lactic Acid Esters of Mono- and Di-Glycerides of Fatty Acids), Butter (Milk), Acidity Regulator (Lactic Acid), Gelling Agent (Pectin), Raising Agents (Sodium Bicarbonate, Ammonium Bicarbonate), Flavouring, Colour (Lutein).